Did you do your first real challenging climbing, because one of your close friends asked you to join in? You were clueless on climbing, didn’t know what to expect, you had no gear! You started with googling “the trek, the equipment needed & anything and everything related with climbing that trek”? Did you? I summited “Stok Kangri” at an elevation of 6153m (20187ft) without having done a single trek! I live in Singapore where the highest peak is Bukit Timah Hill at an elevation of 164m and the tallest building in Singapore is 280m. Forget altitude understanding, I completely trusted google for everything including my gear, my workout plan, altitude issues, etc. The year was 2009. After 7 years of climbing/trekking there are still new challenges I face every trek, but I never forget the mistakes I made on my first trek, the same trek where I fell in love with the mountains an realized my passion to climb! Horizontal Distance vs Vertical Heights: Running a 6km within 30 mins on a horizontal surface it may not be a great distance, but 6km (6000mts – approx. 20K ft) of vertical height is really high. You might need 4-5 days to climb (depending on trek complexity) this is excluding the acclimatization days you might need. The acclimatization game is not for the faint-hearted! Choose your trek wisely: Know your limits before you choose your first trek! I choose a 6000m mountain for my 1st I was physically prepared but not for the mountain or the altitude. I learned the lesson, you can always graduate from an easy to moderate to difficult to challenging to extremely difficult climb. Choose wisely, prepare yourself and plan thoroughly and then experience the trek. Who knows you will start loving the mountains like me and you might be ready to climb the tallest peaks of the world. Prepare your body: Climbing, trekking is not an easy exercise, depending on the trek; it can be rated easy to extreme severe. If you cannot prepare for altitude, prepare your body for the physical endurance. You need to have a good workout plan for endurance, strength and mental fitness. Pack in running, walking, climbing stairs with duffle bag [day bag] with some amounts of weights inside it. Just remember, even if the trek is graded as Easy, it still might be difficult for you if you have not prepared, it is not easy to walk 5-6 hours a day on elevations. Understand Altitude Sickness: my first-hand experience of altitude sickness is hard to forget! I had to turn back from the ABC (Advance Base Camp) and put on Oxygen for a day and stay admitted in hospital as my pulse count was very low. Altitude Mountain Sickness (AMS) can impact you from an altitude of 2500m, it can impact anybody, experienced, novice anybody. For me, it started on Day2 of my trek with throbbing headache throughout the day and night, followed by Insomnia, fatigue and shortness of breath by the day I reached ABC. I was aware of the symptoms and my guide advised me to go back. If you suffer while on trek, listen to your body and go back to lower altitudes and get medical help if needed. You can always come back in couple of months and climb again. Get geared up: On my climb up to Mount Kota Kinabalu (in Malaysia) I was accompanied by a friend who chose to wear her regular sneakers for climbing. On our Summit day, it was raining heavily, and her shoe sole came out, she had to abandon the attempt. You need proper gear for your trek, climb. Before your climb, find out about the trek, the weather, the climb route and then decide on what you should take. Spend some and get the bare minimum you need. The most basic being all weather proof climbing shoes. Stock properly for the trek: stock up Granola bars, Nutrition bars, nuts, etc. If you are taking Diamox, it reduces your body Potassium, increase your intake of banana or orange. Climb Slow: unless you are really experienced, climbing slow helps. Go back: if you are feeling sick! Altitude sickness can get really serious. You are the best judge of your body, listen to it and act accordingly. Check with your GP for Acetazolamide (Common brand name – Diamox): It is used to prevent and reduce symptoms of altitude sickness. Ask your GP to prescribe and use his direction for doses, normally to prevent the altitude sickness start taking the medicine 1 or 2 days before you start the climb. Continue taking it while you are climbing and for at least 48 hours after you reach your final altitude. Having said all the above, one can never really be prepared enough for the mountains! It only makes sense that you go prepared the best from your side! 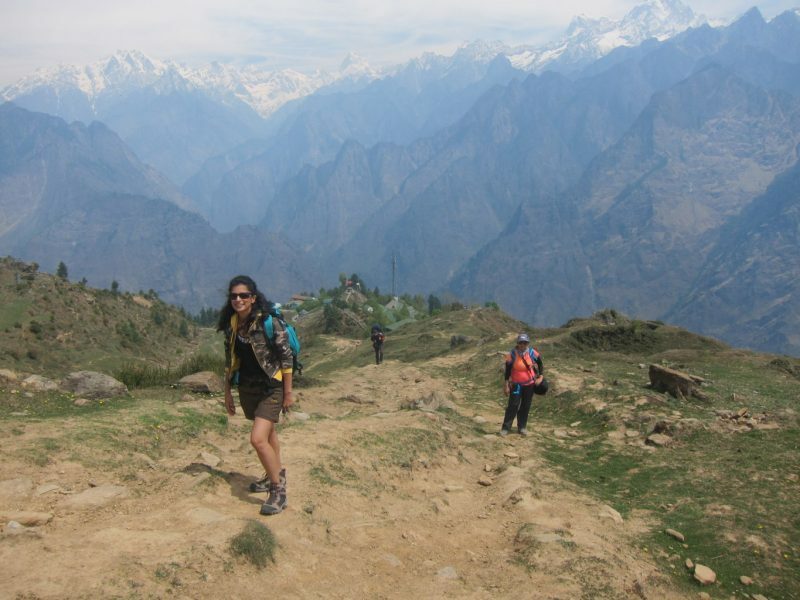 Your very first trek can have you addicted to the mountains and there won’t be any looking back! For the first couple of years of Sanjeev’s climbing resume was all attempted for various reasons. But this never disheartened him and gradually he made some climbing success. He plans to do climb Kilimanjaro, Denali and Aconcagua. He now has mountain climbing experience of 7 years under his belt. He has been photographing the world for a long time now. He is a gym junkie and a newbie runner. Apart from this, he works with a German conglomerate in Taiwan/Singapore. He can be reached @ ssaikia2001@hotmail.com.